3 MONTH EXTRA-LONG STANDBY: 5000mA ultra large capacity rechargeable battery, can standby for 90days Maximum after fully charged. Normal Working time:3 week. MULTI-FUNCTION FOR YOUR CONVENIENCE : Geo Fence, Induction Sensor, Shake Sensor, Overspeed Alert, Low Battery Alarm, etc.using GSM/GPS dual mode position accuracy of up to 5-10 meters. WIDELY USED:Track the location of the vehicles(renting car,truck,moto,freezer,boat etc), Real-time Tracking with Live reporting and History log. View on Phone or on Website. You can also receive GPS coordinates via SMS Text.This device use 2G GSM SIM card. 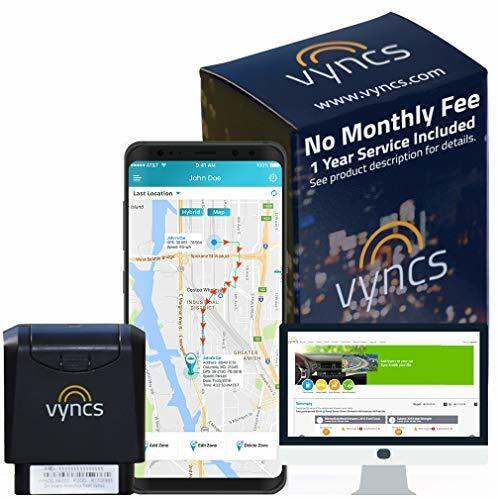 Track and map (with Google Maps) in real-time over the Internet or our free App,accuracy up to 16-32 ft.
Vyncs gps tracker makes owning and driving a car safer, smarter, and a lot less expensive. 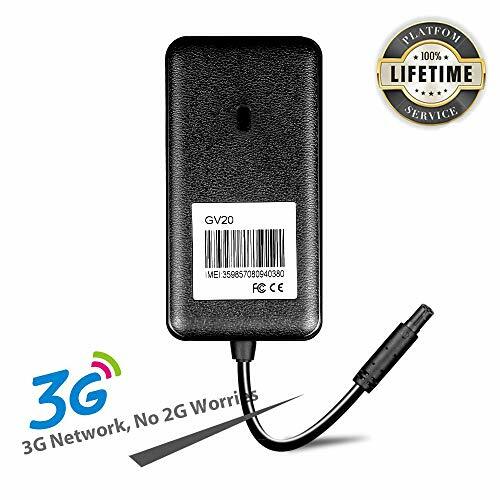 Plug this CERTIFIED 3G wireless Vyncs Link (SIM card included) into the OBD-II port of your car (post 1996), create an account, and you are good to go. BUY ONLY FROM AGNIK (MANUFACTURER) FOR VALID WARRANTY. 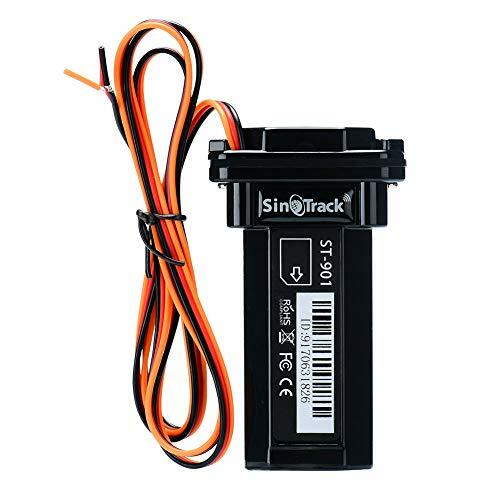 GPS tracker for vehicles. No Monthly Fee! OBD-II Realtime Car GPS Tracker. Highly accurate state-of-the-art GPS & Accelerometer Chip to detect unsafe driving. 3G (also 2G) wireless connection. SIM card, 1 year data plan and 1 year service included from the date of delivery. Web account & Android/iOS Apps. USD 29.99 one-time activation fee (refunded if you return device within 30 days). USD 68.95 renewal fee for the 2nd year. RENEWAL FEE INCLUDES SERVICE AND DATA PLAN FOR THE SECOND YEAR. 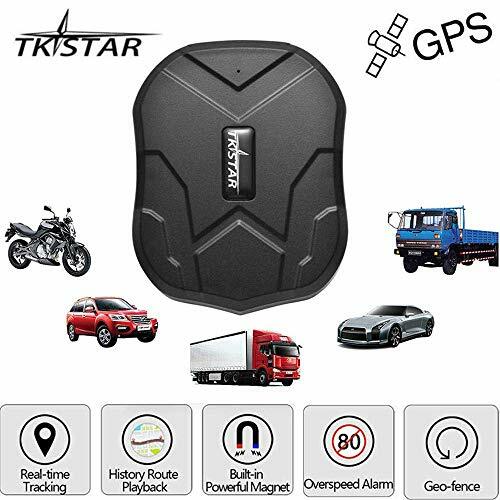 Full service connected car product with Real Time tracking device for cars, 3 Minutes Real-time GPS with 60/30/15 seconds GPS update upgrades available. No battery needed! Draws power from OBD-II port. Goes to sleep after car ignition is off but wakes up once in every hour (when the car-ignition is off) to update location in your account and then goes back to sleep again VYNCSFLEET FOR COMMERCIAL FLEET MONITORING OR TRACKING MORE THAN 5 VEHICLES. Real-time Geofence zone, street address for start/stop points on the map. Hourly GPS update while engine off, vehicle OBD diagnostics, maintenance, battery voltage, emission test results, vehicle recall, fuel economy and fuel level (if available). Driver speeding/braking/rapid acceleration alerts by Push Notification/Email and SMS (upon request), trip history on map, vehicle health score, driving score. Tamper alert sent once device is plugged back into the OBD-II port after it is removed. This North American car tracker model works in Barbados, Belize, Bermuda (United Kingdom), Canada, Costa Rica, Dominica, Dominican Republic, El Salvador, Grenada, Guatemala, Honduras, Jamaica, Mexico, Navassa Island (US), Nicaragua, Panama, Puerto Rico, San Andr s and Providencia (Colombia), Saint Kitts and Nevis, Saint Lucia, Saint Vincent and the Grenadines, Trinidad and Tobago, Turks and Caicos Islands (UK), USA, Virgin Islands (US), and Venezuela. Vyncs Global model works in 177+ countries. If your country is NOT listed above then Purchase ASIN B072LDJKHK and send a message to us through your Amazon account along with your order number in order to get the global model shipped. 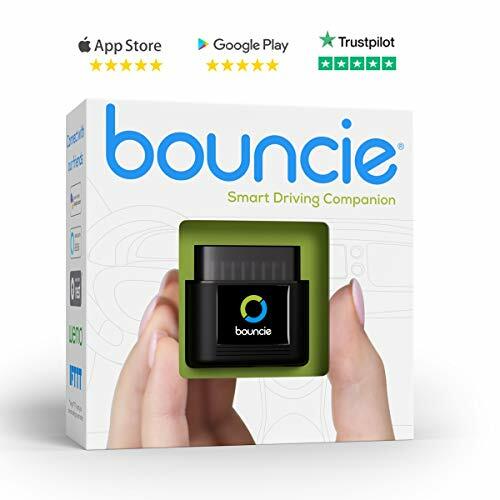 Bouncie is a 3G vehicle tracking and connected car device that upgrades any vehicle into a smart car in under 5 minutes with no tools or wires required. For just $8/month you get: Location - Bouncie updates the vehicle's location while driving then records it's location when it's parked. Habits - Real-time driving insights. With notifications for speed, acceleration, hard braking, and more, better decisions can be made while on the road. Speed Bands - Speed Bands display your drive in color. Bouncie will uniquely color your drive for each speed range you setup! Vehicle Health Manage the little things before they become big problems. Bouncie monitors your vehicle's health and alerts you when something needs your attention. Geo-Circles It's now easy to stay updated when vehicles arrive or when they leave, using Geo-Circle you can drop a circle anywhere; home, school, a friend's house, the mall! Multiple Logins Share the 'keys' to Bouncie with anyone! Access to the app can be enabled for others so they can stay connected to your vehicles. There is no limit on sharing! $8.00 MONTHLY 3G SERVICE REQ'D Cancel Anytime Save with 3 or more! 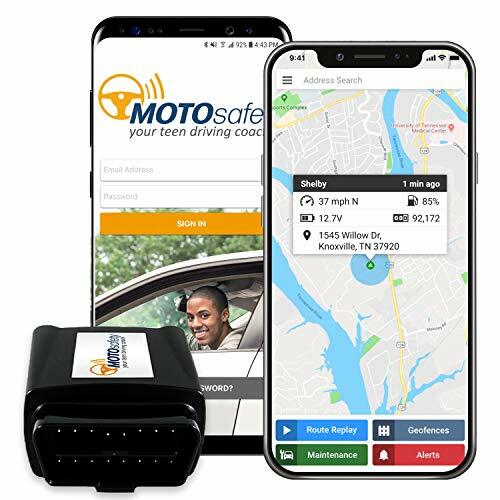 MOTOsafety is a real time, 3G GPS tracker that helps improve driving for teenagers, senior drivers, or anyone who wants to encourage safe driving. Monitor your teen's vehicle location & driving behavior in real time with 100% accuracy using Google Maps. Developed with the input of driving instructors and law-enforcement, MOTOsafety gives parents peace of mind while coaching their teen driver to be safer. Installation: MOTOsafety's OBD GPS tracker simply plugs under the dashboard into the OBD II port of any car or truck manufactured after 1996. With real time vehicle tracking, parents can monitor vehicle location, speed, & direction on Google Maps and receive email/text message alerts based on teen driving habits. Additionally, the comprehensive teen driver education course, with driving report cards, makes it easy to encourage better habits with your teen driver. GPS tracking service ($19.99/month with no contracts); includes manufacturer's limited lifetime device warranty on GPS tracker. Dragy's innovative App redefines the way you measure the time. Discuss your results with other drivers and compete in the leaderboards. Or just superimpose performance data over your phone camera. Features High-performance GPS and GLONASS accurately measures your performance within 1/100th of a second. Share clips, discuss results, and compete in the leaderboards with other drivers! Measuring just 25.4mm x 76.2mm, you can store and take Dragy with you wherever you go. Currently functions with all Android (4.4+) and iOS (8.0+) devices. No OBD connection required. Dragy works completely independently via Bluetooth. New features and revisions are always being worked on. Many things coming down the pipeline! High-performance GPS and GLONASS accurately measures your performance within 1/100th of a second. 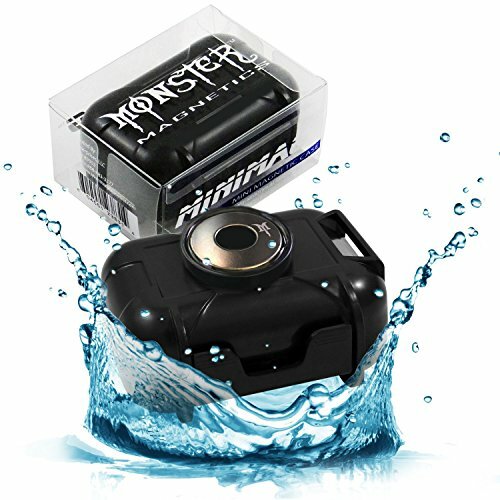 Monster Magnetics MiniMag Waterproof Magnetic Stash Box - All-Weather Hide A Key, Locker Box, Magnet-Mount Geocaching Container, Under-Car GPS Tracker Holder - Easily Hide Your Stuff Anywhere! TRIED, TESTED AND TRUE - WE KNOW WHAT WORKS. Quality starts with design. The sturdy and watertight design delivers ultimate protection by providing a waterproof barrier against water and corrosion damage, giving you the ability to deploy it anywhere - even in the harshest weather conditions. This is the latest version and design and is a culmination of years of testing of tens of thousands of units. For home or everyday use in the field, MiniMag is the clear choice when only the best will do. PROFESSIONALLY DESIGNED FOR UNDER CAR GPS TRACKING. The compact size (exterior 3.5 x 2.2 x 1.6 inches; interior 3.1 x 1.8 x 1.4 inches) and jet black finish are a perfect fit to any of the most popular GPS trackers on the market, including GL200, GL300, Prime, MicroTracker, Spark Nano, Enduro Pro, Trackimo, and many more. The original design was engineered with these universally-sized devices in mind. Pro-grade features make MiniMag the perfect solution - indoors or outdoors, all year long! REINFORCED MAGNET WILL NOT BREAK OFF. Although the magnet strength is important (and our magnet is strong! ), the bigger problems we see are the quality of the enclosure itself - magnets breaking off and inadequate sealant. MiniMag features long life marine-grade sealant and a stainless steel-reinforced magnet assembly. Feel confident in deploying MiniMag without worry of leakage or the magnet coming detached. Don't lose or damage your expensive property to an underperforming enclosure. UNDER-VEHICLE PLACEMENT - ARE YOU IN THE KNOW? When it's time to crawl under a vehicle to place the magnetic case, where do you put it? Relax! We teamed up with GPS tracking experts to create our Under-Vehicle Placement Guide. This illustrated guide provides the information you need to know for optimal placement, where GPS, GSM, and CDMA signals are concerned, as well as recommendations to prevent loss. Follow the instructions on the packaging to download the Placement Guide - for FREE! PROFESSIONALLY DESIGNED FOR UNDER CAR GPS TRACKING. The larger size (interior 4.25 x 2.81 x 1.38 in., exterior 5 x 3.75 x 2 in.) and jet black finish ensures a covert appeal and great fit for larger GPS trackers (Spot Trace Anti Theft, Vectu, Trackimo), and smaller tracking devices (GL200, GL300, Micron Prime, MicroTracker, Spark Nano, Enduro Pro, Trackimo, and more) plus up to a 3-cell extended battery. Pro-grade results are why Monster Magnetics is a favorite in the GPS tracking industry. TRIED TESTED AND TRUE - WE KNOW WHAT WORKS. Our unique manufacturing process defies common problems found in the industry. We've completely eliminated rivets and screws - major culprits of moisture damage and separating magnets. Our magnets are countersunk into the enclosure, and a marine-grade rubber gasket seals the perimeter of the lid, ensuring an airtight seal is maintained. When it comes to protecting your valuables, MiniMag plus is the perfect solution when only the best will do. UNDER-VEHICLE PLACEMENT - ARE YOU IN THE KNOW? When it's time to crawl under a vehicle to place the magnetic case where do you put it? Relax! We teamed up with GPS tracking experts to create our Under-Vehicle Placement Guide . This illustrated guide provides the information you need to know for optimal placement where GPS GSM and CDMA signals are concerned as well as recommendations to prevent loss. Follow the instructions on the packaging to download the Placement Guide - for FREE! AccuTracking has been in GPS tracking business for over 10 years and we stand firmly behind our product and service. - 4 packages to choose from. $12.99/$15.99/$20.99/$25.99 per month (updates every 120/60/30/15 seconds). And more discount for quarterly/yearly payment! - Compatible with Alexa: just ask "where is my car"
- Alerts via email/SMS/online: Geofence, speeding, low battery, inactivity, fence duration, harsh behavior, ignition/ACC, check-engine with DTC, unplug from vehicle, engine idle, oil change, engine temperature, RPM. - In the US 50 states, works in AT&T 3G coverage area only. Contact us for other country coverage. 3G OBD tracker (UMTS/HSPA 800/850/900/1900/2100MHz). Roaming SIM card included for best coverage (USA 50 states, Canada and Mexico coverage. Contact us for 100+ other countries). Works with Alexa (Amazon Echo/Echo Dot). Easy to install: plug into the vehicle OBD-II port and go! No wiring needed. Easy switching between vehicles. Compatible with most cars (NOT compatible with Mitsubishi). Lightweight (only 1.9oz). Lifetime warranty. Excellent reception with built-in GSM and GPS antenna. No hassle of running extended antennae! MOTOsafety is a real time, 3G GPS tracker that helps improve teen driving. Monitor your teen's vehicle location & driving behavior in real timewith 100% accuracy using Google Maps. Installation:MOTOsafety's OBD GPS tracker simply plugs under the dashboard into the OBD II port of any car or truck manufactured after 1996. Activate 3G vehicle tracking service within 30 days of purchase to receive a free month of service, a $19.99 value! Gain peace of mind with our nationwide tracking coverage. Activate 3G vehicle tracking service within 30 days of purchase to receive a free month of service, a $19.99 value! No contracts or cancellation fees. Get a comprehensive teen driving education course with driving report cards that score safe driving (a great tool to encourage better driving habits and get an insurance discount). HIDE A KEY, FOB, FULL SET OF KEYS - AND MORE! Covertly stash your valuables and magnetically mount in, on, under, or behind any magnetic surface - in a secret hidden spot that only you know! The watertight magnetic container will stay securely attached to any magnetic surface - in any environment. Powerful Magnets to Attach to Any Flat Metal Surface. 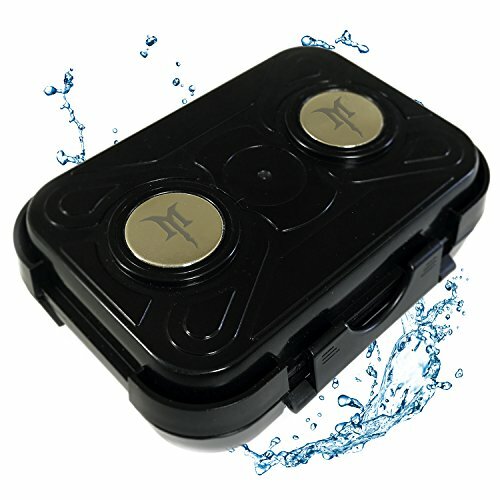 This all-weather dry box makes the perfect under-car hide a key, GPS tracker mounting case, geocache swag container, and stash box for securing keys, money, jewelry, meds or just stashing your goods. We will help you to make the device to work quicly. - Route history tracking to review if your driver's went where they were supposed to go! - May entitle you to a discount with your insurance company! Ensure your vehicle's safety today - Click "Add to Cart" right now and join the thousands of others who are sleeping soundly knowing that their car is safe! 30 Day Money-Back Guarantee! LIKE GPS ON STEROIDS - Included is also a detailed trip tracking which lets you monitor where your car has been. You'll be notified if your car is stolen or a trusted driver is going off course! 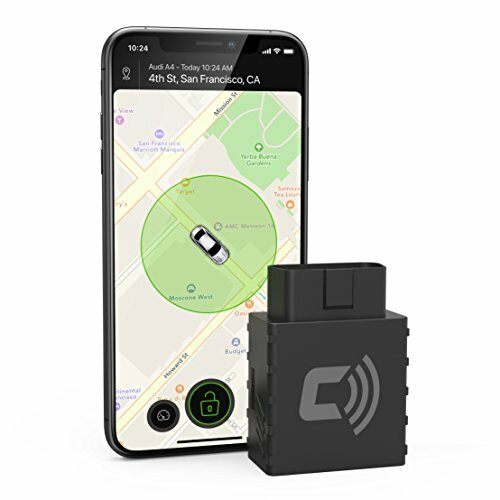 EXTREMELY AFFORDABLE - CarLock uses cloud computing, internet storage, GPS tracking and a modern day app (Andoid & iOS). You get all this for only $9.60 per month and the first month is FREE! Work's on AT&T's network. 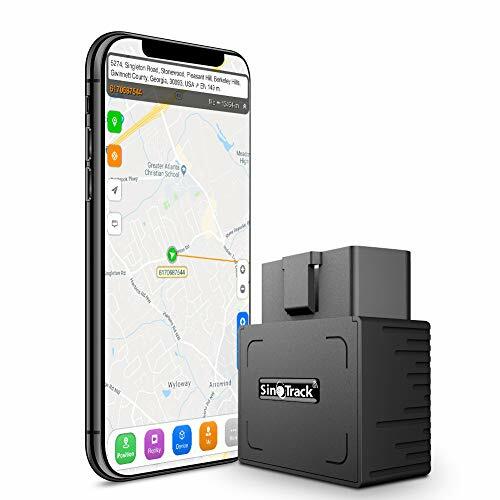 Brand: CarLock | Manufacturer: Protectus technologies, Inc.
GPS TRACKER FEATURES : This GPS tracker offers real-time tracking with up to 5-second updates through Windows and MAC desktop web-access (Chrome, Safari, Edge, Firefox) or through the Amcrest GPS smartphone app (iOS/Android). Create custom geo-fencing zones that alert you anytime the GPS tracker enters or exits a zone. Speed limit, harsh breaking, start/stop and proximity alerts allow you to easily track your vehicles and loved ones. Access your data with intelligent reporting directly from your iPhone, Android, Mac or PC. This Amcrest GPS Tracker is built to last with heavy-duty materials including an IPX5 water resistant housing. Battery last up to 10-14 days on a full charge with 60sec updates (7-8 days with 30sec updates, 4-5 days with 15sec updates, and 2-3 days with 5sec updates. worldwide 2G coverage in all countries and across all networks which support 2G. MONTHLY SUBSCRIPTION PLANS : 60 second updates - $19.99. 30 second updates - $24.99. 15 second updates - $29.99. 5 second updates - $34.99. 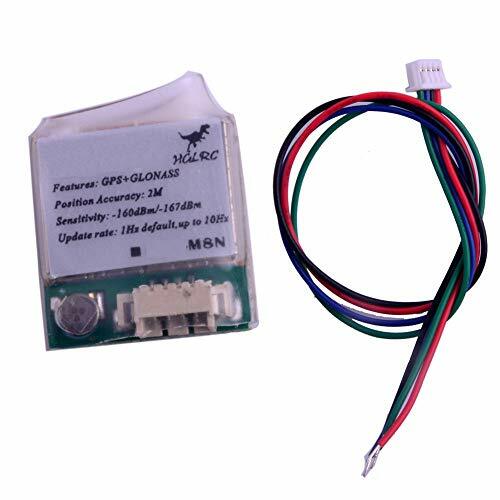 PACKAGE INCLUDES : 1 x 2G GPS Tracker (AM-GL300). 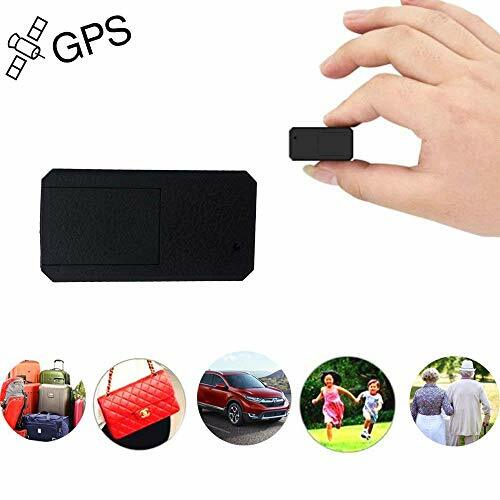 COMPACT 2G GPS TRACKER - Excellent GPS tracking device for vehicles, loved ones (teens, spouses, children, elderly, pets) or anything you want to track. Monthly subscription required. No contracts or activation/cancellation fees. $19.99 - 60 second updates. $24.99 - 30 second updates. $29.99 - 15 second updates. $34.99 - 5 second updates. 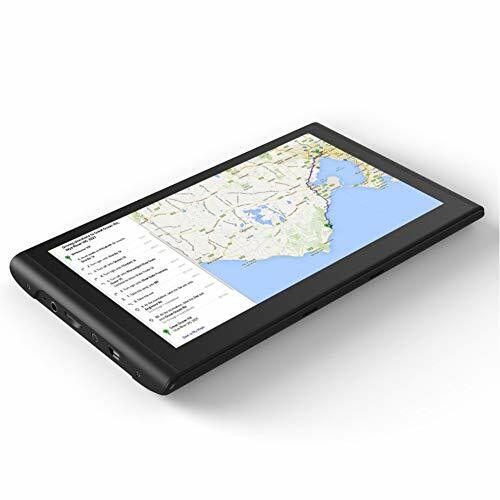 REAL-TIME SMARTPHONE & PC TRACKING - This GPS tracker offers real-time tracking with up to 5-second updates through Windows and MAC desktop web-access (Chrome, Safari, Edge, Firefox) or through the Amcrest GPS smartphone app (iOS/Android). The intuitive user interface allows you to easily monitor activity, manage alerts and generate custom reports. Create links and share them with your friends, family and co-workers to keep track of cars, children, seniors and assets. GEO-FENCING, SMART ALERTS & REPORTS - Create custom geo-fencing zones that alert you anytime the GPS tracker enters or exits a zone. Speed limit, harsh breaking, start/stop and proximity alerts allow you to easily track your vehicles and loved ones. Receive text, push and email notifications directly to your smartphone or PC with the Amcrest GPS app and desktop web-access client. Access your data with intelligent reporting directly from your iPhone, Android, Mac or PC. 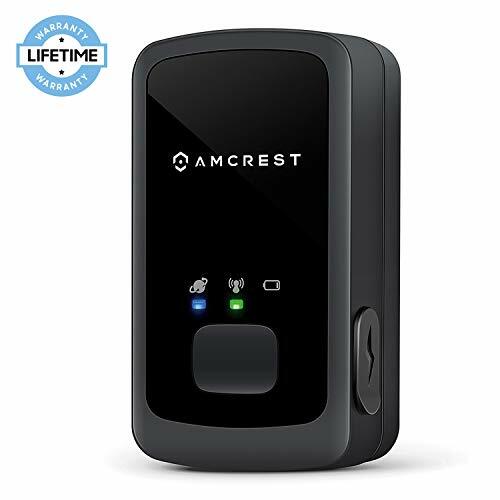 BUILT TO LAST - GOOGLE MAPS - This Amcrest GPS Tracker is built to last with heavy-duty materials including an IPX5 water resistant housing as well as battery which lasts up to 10-14+ days on a full charge with 60sec updates (7-8 days with 30sec updates, 4-5 days with 15sec updates, and 2-3 days with 5sec updates). Utilizes Google Maps for tracking and mapping. GLOBAL COVERAGE - LIFETIME WARRANTY & SUPPORT - Included worldwide 2G coverage in all countries and across all networks which support 2G. We stand by our products and offer a lifetime warranty and unlimited support. Contact us at amcrestgps@amcrest.com for troubleshooting. In the event that your device produces undesirable results, we'll gladly refund 100% of your hardware and subscription charges. GPS Tracker is limited to 2G and will only work in areas where there is 2G coverage. Autobrain is awesome! Autobrain turns any car into a smart car in minutes, so you can have peace of mind knowing that whoever is behind the wheel stays safe, whether it is your parent, teen, or spouse. Just plug the Autobrain device directly into your cars diagnostic port (usually under the steering wheel) and open up the app on your smartphone, tablet or computer. Autobrain is affordable! Includes a 30-day trial and Only $9.97 per month afterward. Free activation. No Contract. Cancel anytime. Autobrain will even buy back your device and cover return shipping! * Autobrain is all about safety! With Autobrain, you will have access to the most complete set of safety alerts and features available, including real-time vehicle location, vehicle diagnostics, and mechanic helpline, 24/7 roadside assistance, trip reports, speed and location alerts, curfew notifications, emergency crash response and even a backseat-baby reminder. AUTOBRAIN PRICING: Our monthly service is only $9.97 includes a 30 day free trial and no long-term contracts. Want to cancel? No problem, we will even reimburse the cost of the device (Up to $20) and pay for return shipping*. 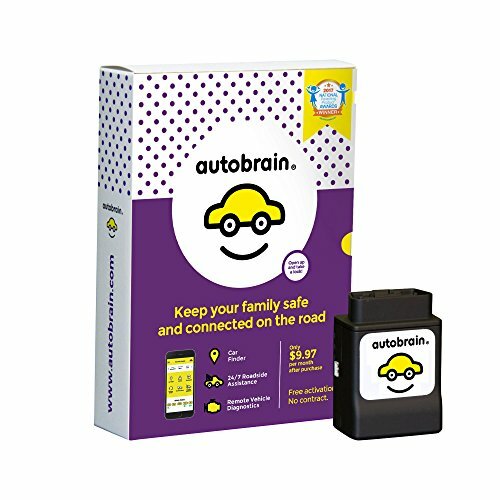 AUTOBRAIN KEEPS YOUR FAMILY SAFE: Teenager and senior driving monitor tools help you keep track of your loved ones and provides real time access to car location, fuel level, speed alerts, trip reports, curfew alerts and more. AUTOBRAIN SAVES YOU MONEY: Check engine light on? Autobrain OBDII offers full vehicle diagnostics and can even connect you to a trained auto specialist who can help. AUTOBRAIN IS EASY TO USE: Simply plug the Autobrain device into your car's OBD 2 diagnostic port, download the app on Apple or Android smartphone devices and navigate the on-screen menus. Works on PC, Mac, iPads and tablets. AUTOBRAIN IS THERE WHEN YOU NEED IT MOST: 24/7 Roadside Assistance covers you for 4 service calls per year including towing(15-miles per tow), flat tire, dead battery, gas delivery and key lockout service. AUTOBRAIN EMERGENCY CRASH RESPONSE: If Autobrain detects that you've been in a crash, our emergency advisors can contact you right away. If you can't answer our call, emergency responders & your loved ones will be notified right away. AUTOBRAIN WORKS WITH YOUR CAR: Autobrain works with cars, trucks, vans, and your favorite manufacturers like Toyota, Honda, Chevy, Ford, Audi, BMW, Mercedes, KIA, Vizr, Hyundai, Jeep, Nissan, Range Rover, Mazda, Acura & more. Add GPS to your Celestron computerized telescope and get time, date, and location downloads from orbiting Global Positioning Satellites. 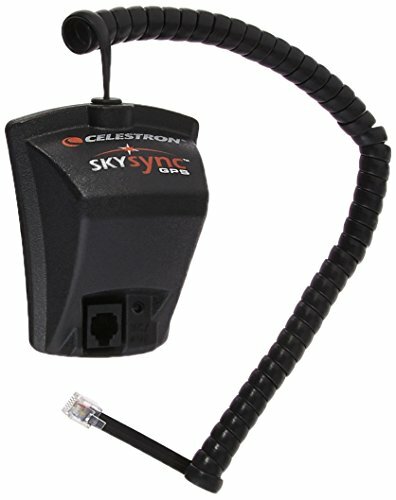 This 16-channel GPS module plugs into your telescope s hand control or the auxiliary (AUX) port on your drive base and then mounts to a tripod leg to stay safely out of the way with included straps. Sky Sync makes it easier to align your telescope while keeping your date and time updated. [Lifetime Map Updated ] 2D/3D map view mode. we have preload latest map of America for this GPS, if you want to update the map, just feel free to contact us and we will provide an address for you to download. [Easy to Use]When you plug it, the GPS navigation will open automatically. when you power off the screen will appear sleep. [Large Capacity]Compared to the common unit, this GPS navigator built-in rechargeable Li-ion battery, then keep the product work longer and more steadily. [Big Screen] With TFT LCD Touch Screen and the color feels comfortable for your eyes, Also you can change the map mode between the day and night. 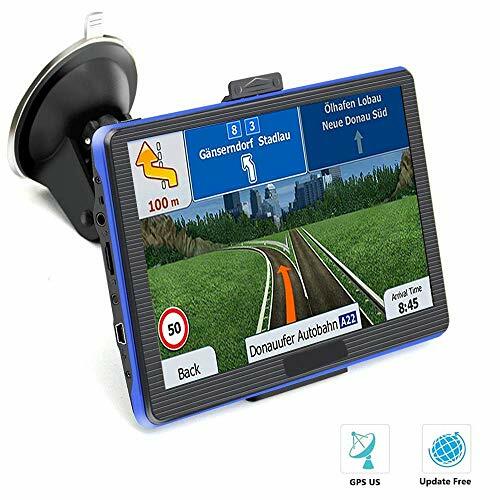 [Practical GPS Navigation] 8 GB ROM 256 MB RAM provides plenty of room to start and operate quickly; which also ensures high speed and perform smoothly. 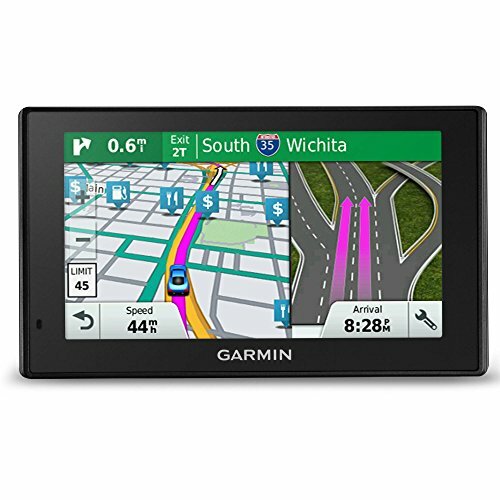 Garmin DriveSmart 5 NA LMT EX is an advanced GPS navigator with five-inch pinch-to-zoom display that combines the latest in driver awareness features with Bluetooth hands-free calling, voice-activated navigation and onscreen smart notifications (calls, texts and other app alerts) to encourage safer driving. It includes preloaded maps of North America with lifetime updates, free HD Digital Traffic, Active Lane Guidance and more. You're alerted if approaching traffic jams, dangerous curves, speed zone changes or railroad crossings. Plus, a fatigue warning even suggests a break after hours of driving, identifying potential rest areas ahead. 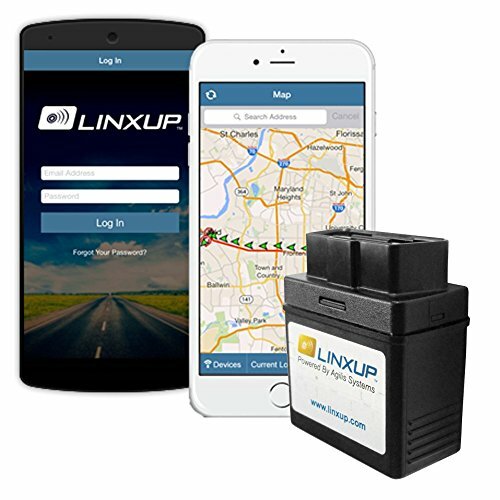 Linxup GPS trackers also have a native mobile app for iOS and Android. Monitor driving activity and the location of your tracking device even when you're not in the office. The GPS system creates a driver safety report card that summarizes and rates each driver's activity and compares it with the other drivers in your fleet. Use Linxup's valuable reports and dashboard to reduce your fleet's fuel consumption and monitor driver safety. Make more service calls and reach more customers each day. Free GPS tracking mobile apps with unlimited real-time email & text message alerts. Tracker installs into OBD port and includes manufacturer's limited lifetime device warranty. Video player: MPEG-4, DivX, Xvid, MPEG-2, MPEG, AVI, DAT, MPG, MP4, etc. Output power: DC 5V 1.5A. Vehicle charger: input: DC12-24V output: DC5V 1.5-2A. AC charger: input: AC100-240V 50/60HZ 0.3A MAX output: DC5V 1.5-2A. Support Map: Europe Map / Australia Map / Middle East Map / North America Map / South America Map / Southeast Asia Map / Africa Map /(Map is not all product support, just download the map according to your order). Operating system languages: English, French, German, Italian, Portuguese, Russian, Spanish, Hungarian, Polish, Finnish, Romanian, Ukrainian, etc. Map programming languages: Arabic, Bosnia and Herzegovina, Catalan, Czech, Croatian, Danish, English, Estonian, Finnish, French, German, Hebrew, Hungary, Indonesia, Italy, Latvia, Lithuania, Netherlands, Norway, Portugal, Poland, Romania, Russian, Spanish, Sweden, Slovakia, Slovenia, Thailand, Turkey. Only the contents of the previous package, other items are not included. --7.0 "capacitive screen with resolution of 800x480 pixels. --Built-in speaker, volume adjustable, with Touch screen operation. --Navigation software can run TF card directly. --Support video formats: MPEG-4, DivX, Xvid, MPEG-2, MPEG, AVI, DAT, MPG, MP4, etc. --Support photo formats: JPG, GIF, BMP, TIF. 2. Build in 180mAh / 3.7V battery. 3. Real time vehicle tracking. 5. Work with any 16 - pin OBD interface cars. 6. Can locate and get the position of your vehicle remotely via GPRS. 7. Support function of map location inquiry. 8. No installation, no wiring harness, simply plugs into OBD port. Warranty: With 1-Year manufacturer Warranty and 30 days no-questions-asked return policy. When light sensor detects unauthorized displacement from the original installation, device will send alert to SOS number. Alert method from be SMS, CALL or GPRS. Defaulted method is GPRS. 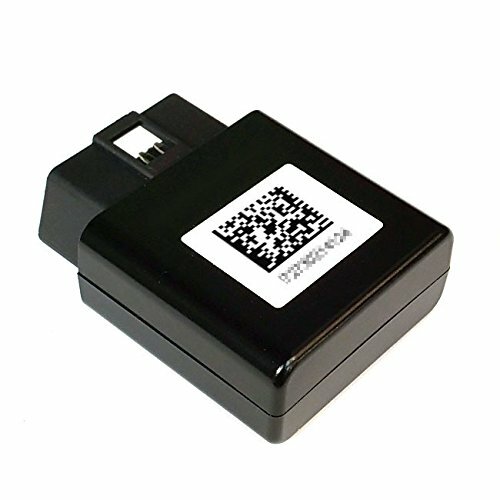 [Remote Cut-off Oil/Power] - This is professional anti-theft and anti-lost gps car tracker, if you think your car is moved unexpectly or your phone is received unnormal alarm, you can send command through SMS or tracking website to cut off the power/petrol connection of the vehicle, leaving the illegal user hopeless. 1) Open the box.check the device and accessories. GPRS traffic available in the SIM Card.The locator doesn't support 2G and 4G. 3) please put the sim card in GPS Tracker.then led will lighting. 4) Please Download APP from Manual.Use ID Log in. 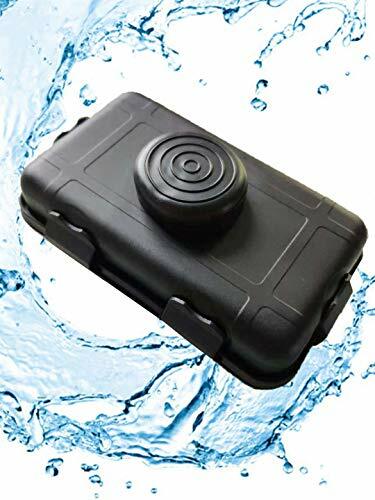 1-Waterproof IP66: our GPS Tracker with the design of waterproof IP66,dustproof and shockproof, so that you do no need to worry about rainy days. Note: SIM card not included. (60 days standby time) Free Platform No Monthly Fee. 3-Geo Fence: SMS tracking and movement alarm allows you to set a geo-fence for the tracking device to limit movements within a district, for the reason it can check the history of route and monitor the communication. 4-Easy to Install: attach it to any iron surface with strong magnets, even under the car for just a second, then the device can be installed quickly and permanently. Besides, you can use sleep mode for LBS positioning and web online tracking as you prefer. NOTICE: DOUBLE SYSTEMS OF OBD2 AND GPS, COMPATIBLE FOR ALL CARS. PLUG AND PLAY, 11V~18VDC (12VDC/200MA), PLEASE USE THE USB CABLE WHEN VOLTAGE HIGHER THAN 24V. 1. Combine the OBD2&GPS HUD system into one, free switch in one step. Compatible with all kinds of vehicles. 2. With master professional 'flat design' of the base as well as using a 'transparent Reflective Board', this product will NEVER block your sight level on driving, which gives you a best driving experience. And the high-quality reflective board will not have the problem of double image! 3. Multifunction with display speed in km/h mph, engine rpm, fuel consumption, water temperature, 0-100 speedup test, satellite signal, driving direction, mileage measurement, clear engine error code.  OBD2 & GPS DUAL SYSTEM One switch for double mode OBD2 & GPS, freely and easily switch, plug & play, easy for installation. Compatible for all cars in the market.  Depth of Field Visual Effect With master professional 'flat design' of the base and using a 'transparent Reflective Board', the car HUD use semi-transparent and semi-reflection lens to make the information display stereoscopically in the air, eliminates unwanted reflections and can make display information more sharper, help drivers keep their eyes on the road.  MULTI-FUNCTIONS DISPLAY OBD2 Mode Display: Speed Km/h MPH, Fuel Consumption, Engine RPM, Mileage Measurement, Water Temperature, Speedup Test, Battery Voltage. GPS Mode Display: Speed Km/h MPH, Altitude Display, battery voltage, Satellite Signal, Driving Direction. TIPS: IF YOUR CAR IS NOT COMPATIBLE WITH OBD2 INTERFACE, YOU COULD SWITCH TO GPS MODE.  DUAL-CORE PROCESSOR Industrial integrated circuit design with RAM microcontroller and professional solution chip, to ensure the data won't delay. 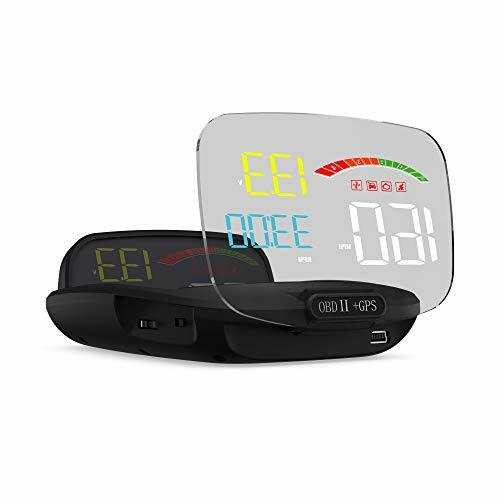 High-definition and Depth of Field Visual Effect help you eliminate useless and unwanted reflections, this product will NEVER block your sight level on driving, which gives you a best driving experience. And the high-quality reflective board will not have the problem of double image! 1. 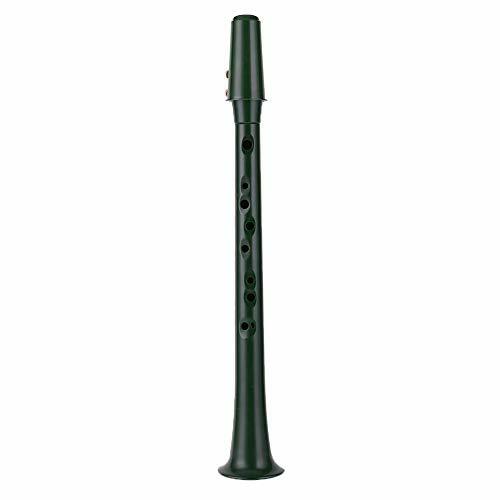 Mini Pocket Saxophone with a matte finish. 2. Mini size, light weight and easy to carry. 3. ABS material can be used for a long time. 4. Playability and color are close to real saxophone. 5. Suitable for any music lover and professiona. Mini Pocket Saxophone with a matte finish. Mini size, light weight and easy to carry. ABS material can be used for a long time. Playability and color are close to real saxophone. Suitable for any music lover and professiona. The m8n gps moodule doesn't have compass and flash. The vertical and horizontal accuracy is less than 2 meters. The default baud rate is 9600, but you can change it in software. If you flight control have TX and RX, this gps works with your device. If you need more document, please contact me by message. 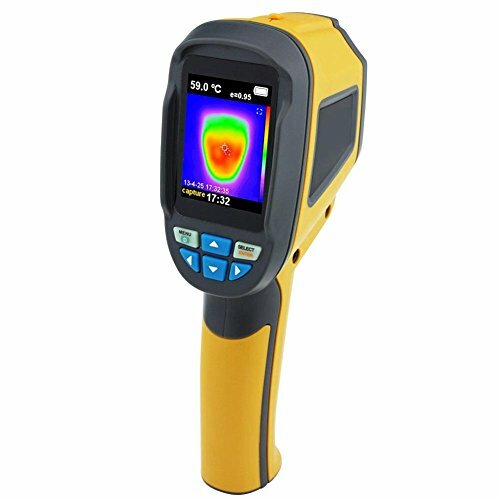 Handheld thermal imaging thermography, infrared thermal imager, 2.4 inch color camera. 3.If you want this product, please don't hesitate. Our product can be your good choice. Region free, It can be used for any version of For Nintendo For W ii/For W II U. Free and comfortable to hold them in whichever hand. Compatible with all US games, software, hardware, and everything else. Powered by 2 AA battery. (NOT Included) . 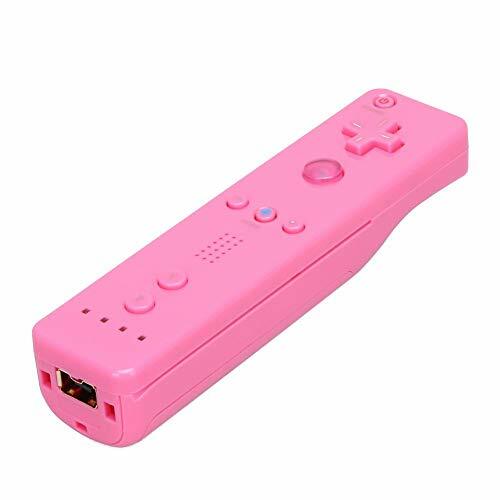 Compatible with: For Nintendo For W ii/For W II U.